O n a cloudy Saturday morning of Memorial Day weekend, 1990, 40-year-old Marlene Warren was at home on her sprawling property in Wellington, Florida. Marlene’s 21-year-old son, Joey Ahrens, was home, too, finishing breakfast with several of his friends. Just before 11 a.m., a white Chrysler LeBaron convertible pulled into the circular driveway. The driver stepped out, walked to the front door and knocked. It was a clown in full costume, including orange curly wig, white painted face and a red bulb nose. It was holding a delivery of balloons and flowers. As the clown handed Marlene the delivery, it pulled out a gun, aimed point-blank at Marlene’s face, and fired one bullet. Her son Joey heard the shot — it sounded like a balloon popped. But when his mother collapsed to the floor, he rushed over to the doorway. Marlene was bleeding heavily from her face. As his friends called for help, Joey looked up at the clown walking away. It paused and turned to him, just long enough for Joey to see big brown eyes staring back. The clown casually walked back to the LeBaron, got in and drove off. Joey jumped in his own car with one of his friends to try to chase the LeBaron down. But he was too late, and the clown escaped. An ambulance arrived at the home as paramedics worked frantically to save Marlene. The bullet had entered just above her upper lip, broke through her two front teeth and traveled into the back of her head where it was lodged in a vertebra. They rushed her to Palms West Hospital, where doctors put her on life support. But Marlene never really had a chance, and she died two days later. Marlene Mae McKinnon was a happy girl who spent part of her youth on her grandfather’s farm in a town north of Detroit. She was the middle of two sisters — Debbie and Lee Ann. Marlene’s family moved around a lot, including spending years in California before returning to Michigan. Marlene was exceptionally young when she married her husband John Ahrens and became a mom. She gave birth to her first son when she was just 15 years old. By the time she was 18, she was the mother of two boys. Marlene’s parents don’t remember exactly when she met and married John, but they remember when she lost him. It wasn’t long into the marriage. Marlene and John just had their two sons, John Junior and Joseph. They were toddlers when tragedy struck. John was involved in a car crash in Texas and didn’t survive. Marlene was a widow and single mother before she was even 20 years old. Marlene didn’t wait long to make a new start. Within just a few years, she met Michael Warren and they married in 1972 when Marlene was 22 and Michael was 19. The Warrens lived for a short time — possibly less than a year — in Michael’s hometown of Mount Clemons, Michigan, a suburb of Detroit. They decided to relocate to Florida to raise the boys, so they bought a home in Palm Beach County. They lived in it for a while, sold it for a profit, then did the same to their next home, and the next — building up their wealth each time. They also started buying land and buildings for rental properties — eventually amassing 17 throughout the county. Marlene managed and maintained them while Michael built up a business selling and renting used cars. By the late 1980s, the Warrens’ businesses were paying off. They bought an acre of land in a new, exclusive community in Wellington called Aero Club and built a 6,500-square-foot home. There is not much that’s modest about the Aero Club development. The homes are spacious, most with long, circular driveways, swimming pools and meticulous landscaping. Aero Club gets its name from perhaps its most unique feature. A private air strip — and the taxiways that lead to each home around it. The Warrens’ was one of them. It was on Take Off Place, and the lot had plenty of space to park Michael’s airplane. Michael’s used-car business was flourishing. That was despite legal problems in the early 1980s that foreshadowed much larger issues that would come years later. In the spring of 1983, Michael had been caught rolling back odometers on two cars he sold. When a customer turned him in to authorities, Michael was charged with a third-degree felony. He pleaded guilty and was sentenced to 18 months of probation. But by 1990, business was strong enough for Michael to open a bigger lot called Bargain Motors along busy North Dixie Highway in West Palm Beach. He employed a motley crew of mechanic, salespeople, car detailers, office workers and repo men who went after customers who didn’t pay. One day, one of his occasional repo men showed up at Bargain Motors in a tow truck. He was known by the name Spud and he was a long-time friend of Michael’s. On this visit, he brought along his wife. She bounded out of the truck, onto the lot and into Michael’s life. Her name was Sheila Keen. Sheila was young and exuberant, a striking brunette with long, glossy hair. She was a headstrong, gun-toting, independent 26-year-old with a game-for-anything reputation and mischief in her big, brown eyes. Sheila spent more and more time on Michael’s lot and soon she was repossessing cars on her own. Fearless and tough as nails, she had no qualms about driving a flatbed truck into the roughest neighborhood to reclaim a car. The more time she spent on Michael’s lot, the more responsibilities and duties she took on. She was virtually running the place. But Sheila’s attention, all of it, went toward one person. Her 6-foot, 1-inch, blue-eyed boss, Michael Warren. And Michael clearly had feelings for Sheila too. She was a stark contrast to Michael’s wife Marlene, the strawberry blonde, blue eyed, slightly pudgy housewife. Michael’s relationship with Sheila was evolving into an affair. It had become obvious to everyone, including Sheila’s husband, Spud, whose real name was Richard Keen. By January 1990, Sheila and Richard split up. Michael Warren was on his way with friends to a horse racetrack in Miami when Joey Ahrens called him with news of Marlene’s shooting. He turned around and headed for the hospital, where he told police he had no idea who could do this to his wife. The media jumped on the terrifying story that became national news. Jim Di Paola was one of the first reporters on the scene of the shooting in Wellington. He’s reading the front page of the newspaper that had the terrifying story. (Jennifer Lett / South Florida Sun Sentinel). Police had a trail to follow almost immediately. Within two hours of the bullet hitting Marlene Warren’t face, a call came in to police that would focus the investigation close to home. An anonymous female caller said: “You might want to ask Michael Warren and Sheila Keen a few questions.” Then she hung up. The tip certainly made sense. Everyone had seen the way that Michael and Sheila were carrying on. But were they killers? Would this case really be so simple to crack? 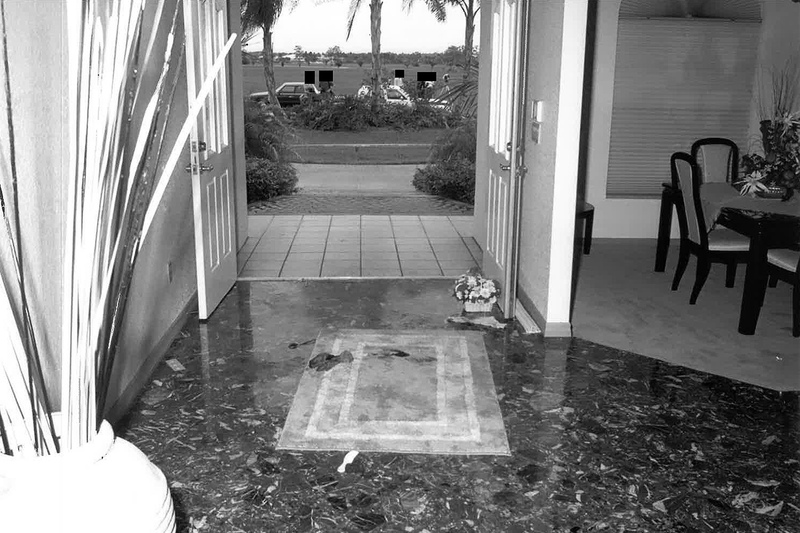 Marlene Warren’s murder led to an extraordinary and baffling murder investigation that led police through the darkest corners of the Sunshine State. They were encountering accusations of loan sharking, drug smuggling and dealing, insurance fraud, chop shops, stolen cars, prostitutes, seedy affairs and more. And they spent nearly three decades searching for the clown who showed up at Marlene Warren’s door with flowers, balloons and a pistol.